Use heart-shaped paper doilies to make these sweet little sachets, scented with fragrance oil or your favorite perfume. Glue together two paper doilies with clear drying craft glue, leaving an opening at the top center of your doily (wrong sides together). Allow the glue to dry. Tear up a little white tissue paper or you can use cotton balls and spray a little fragrance on the tissue or cotton. Once your glue on the doilies is dry, push the scented tissue paper inside the doily, insert a small piece of ribbon at the centre inside top to create a hanger and glue the doily opening closed, with the hanger between the two doilies. Allow the glue to dry before handling again. Using hot glue, glue a small bunch of roses, pearl strands, etc., to the top centre of the heart. You can also add a written greeting to the centre of the heart. If you decide to add a greeting, be sure to make this the first thing you do, as it will be difficult to write on the doily once it is assembled. These can be used inside drawers, attached to hangers, car freshners or anywhere you want to add a little fragrance. Once the scent has diminished, you can simply spray the outside of the heart with new fragrance. 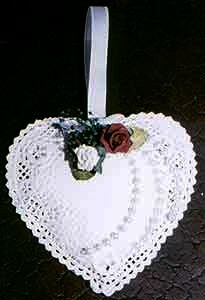 It’s recommended that you spray the back of the heart, as the fragrance may leave a stain on the doily. Spraying the fragrance evenly over the back of the paper heart sachet will help to hide any stains that may be left behind from the fragrance.